Remember those quaint notions of policy uncertainty holding back growth? Well, what to make of recent moves in uncertainty and risk indices, given all the talk of trade wars? Figure 1: US daily Economic Policy Uncertainty index from Baker, Bloom and Davis (dark blue), and seven day centered moving average (red). Orange shading denotes Trump Administration. Source: policyuncertainty.com, and author’s calculations. Figure 2: Seven day centered moving average of US daily Economic Policy Uncertainty index from Baker, Bloom and Davis (red, left scale), and VIX (blue, right scale). 3/5 observation for 2PM EST. Orange shading denotes Trump Administration. Source: policyuncertainty.com, and author’s calculations. This entry was posted on March 5, 2018 by Menzie Chinn. Your post always have a point, so what is it? Are you showing that for the Trump administration, and despite the constant anti-trump rants we read and see in the main media, that uncertainty index is generally falling? And that means what, that Trump seems better than most recent politicians to mean his promises and to follow through on them and people are now realizing this and uncertainty is reduced? Sure wish you had extended your plot to cover other administrations so we could see if the pattern of rising uncertainty just before gaining office, followed by reducing uncertainty is the normal trend. Is it? There’s a lot of people in this world bad at reading comprehension—some mentally slow, some never taught properly how to glean highlights of text, some who read too fast, and some who only read the first paragraph. But those who are not intelligent enough to read a pictogram or very obvious visual cues fall into a much smaller populated category of people. I suggest you see a specialist soon and have an MRI scan done on your brain. 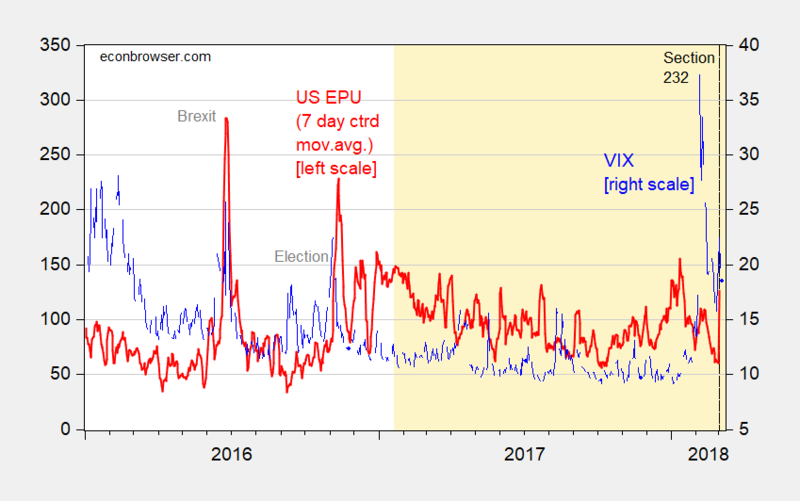 Ed Hanson The top chart is telling us that up to the Nov 2016 election there was only one significant spike in the uncertainty index. 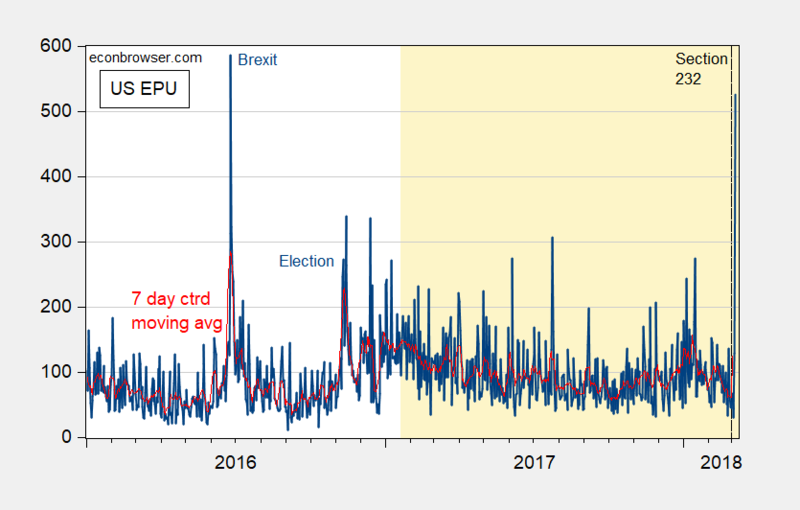 And that spike was due to the dysfunction of British politics and was outside of US politics; however, it’s worth noting that Trump supported Brexit. Of course he did…Brexit was idiocy on steroids, so naturally Trump supported it. After the 2016 election you see greater and more frequent volatility. The chart almost screams for some GARCH style analysis. Now it would be interesting to see what the uncertainty index would look like prior to 2016. My guess is that it would show spikes whenever the GOP Congress did something stupid, such as threaten to default on bond payments. Can you really not see the giant spike at the end due to the tariff announcement? And how uncertainty, while trending lower until the tariff announcement, has been higher on average since the election than in 2016? The uncertainty index rose when Trump was elected. Makes sense since it was a surprise. The index began falling the day of his Inauguration, and has continued to fall ever since. What do you think spikes mean? Go to policyuncertainty.com and see for yourself. You can see the charts that Menzie published but with a much longer time period so you can get an historical perception. You will see that the Trump spike that bothered you is neither large nor unusual for the index. While you are at that web site read the information they use to determine the index. That too will give you perspective to better interpret what is currently going on. And while you are there look at the index during the Obama years. If spikes and high index levels still bother you, you can see what should have been bothering you for those 8 years. I still do not see these Trump tariffs being enacted. All of this is lip-service and flailing around of arms to satisfy the illiterates, such as people in West Virginia with a public education system starved of funds and resources by Republicans. They see the tariff headlines and his verbal bravado on TV for a few days and they say “He’s fighting for us!!! !” Then they go back to picking boogers out of their nose and wondering why another coal plant just shut down—having no idea that the tariffs won’t be passed anyway–and that Trump indeed has no intention of enacting them into law. The VSG is the VSG—what the antichrist would look like if he had empty space between his ears and skin like TBN’s Ann Crouch if she’d used meth for 10 years. The answer to your questions and observations do not lie within Menzie’s charts as I suspected. His time period charted is to short for perspective. Please note the following quote from policyuncertainty.com, it aptly demonstrates that heighten uncertainty is not just a Trump phenomenon (too short a time to declare a trend but uncertainty is lower than that seen the 8 years of the Obama Presidency). “As measured by our index, we find that current levels of economic policy uncertainty are at extremely elevated levels compared to recent history. My advice which I take seriously for myself, don’t be so sure you know the whole story from limited information. You should take note that because of limited information my first post was a series of questions to Menzie who has more extensive information than he posted and was an honest inquiry. Ed Hanson: And the biggest financial crisis and recession since the Great Depression is of no relevance to this inference. Yeesh. Of course, so when does financial crisis effect stop. At the change of administrations, I think not. Another possible time to consider, around the start of 2015. The charts would seem to indicate so. And the Uncertainty index is about the same as 2017. So no yeesh needed. So what is your answer to your question. Is growth being retarded? Your inadequate time period charts do not make it clear. Ed, if I’m following the dialogue, your argument is that it seems reasonable to compare the UI at present with a longer time frame to see if previous spikes all translated into economic downturns. Menzie, on the other hand, seems to be saying that the UI is higher now than in the past two years which should be seen as a warning sign. I’m not sure that there is a wrong position being offered by either of you. The UI is one factor in the Magic Eightball of economics that attempts to analyze the impact of current events on the near-term economic conditions. As noted in his previous post about the “event analysis”, there was a reaction on Wall Street to the mere thought of a “trade war” because of imposing specific tariffs. I noted in the comments of that post that I waited several days to see if it was a knee-jerk reaction or something more serious and prolonged. While the DJIA recovered 400 points and partially offset the recent plunge, the bigger story is that the market has been essentially flat for several months with an upturn based on tax law changes (event) and a downturn based on threatened tariffs (event) which basically created a wash.
Was the DJIA going to go straight to 30K without pausing? Probably not. Was the euphoria over tax law changes going to have a pullback for any reason to take profits? Probably so. Now if the DJIA slips to 20K because tariffs are implemented and investors bail, then I accept that as an “event”. I don’t like Trump’s style. I suspect that the uncertainty is having a significant negative impact on near-term Canadian economic growth, largely through the investment channel, but all through 2017, the broader markets shrugged off Trump’s adolescent, thuggish bravado. Canadian markets have been weak but that strikes me as largely driven by weak commodity prices and then domestic factors that are created purely by Canadians themselves such as the singular inability to get new pipe to tidewater. Canadians are not playing very well together these days. Come to think of it, Canada has a lot in common with the USA these days. Ed Hanson: See my response. I used the entire sample available from BBD, and used what I think is the appropriate econometric technique. Quite simply, you (again) are wrong.